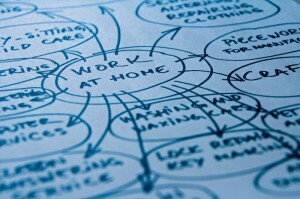 You can do this through writing lists or outlining but a visual map is sometimes easier to relate to. 1, Start in the centre with an image of the topic, using at least 3 colours. 2, Use images, symbols, codes, and dimensions throughout your mind map. 3, Select key words and print using upper or lower case letters. 4, Each word/image is best alone and sitting on its own line. 5, The lines should be connected, starting from the central image. The central lines are thicker, organic and thinner as they radiate out from the centre. 6, Make the lines the same length as the word/image they support. 7, Use multiple colours throughout the mind map, for visual stimulation and also to encode or group. 8, Develop your own personal style of mind mapping. 9, Use emphasis and show associations in your mind map. 10, Keep the mind map clear by using radial hierarchy, numerical order or outlines to embrace your branches. There are a number of different versions and incarnations of it. And now in the world of apps a number of ways to play with mind mapping on an increasing number of devices. My favourite for value and simplicity across Apple devices is Mind Node. I use a combination of physical and digital tools including a card system called Artefact Cards which is great when working with someone else or in a team. Remember you can always capture physical mind maps with your digital camera. I often do that and save them to my Evernote account. Why don't you try one now. Get a piece of paper and a pen. In the centre of the page write the keyword about your issue and circle it - 'Call boss about payrise', 'How to get healthy for Xmas', 'What makes a perfect family holiday', 'New Business Launch', 'My Life' ... Then let your mind wander adding any thought as they arise with a line to the centre. If the new thought is important, circle it too and branch new stuff off it. Follow the guidelines above and find your own way. Next time you feel unsure about something try to unravel it with a mind map.